10-Minute Drunken Teriyaki Noodle Stir Fry — Copina Co.
Guys! It’s finally here: my recipe for 10-Minute Drunken Teriyaki Noodle Stir Fry! I’ve been dying to share this simple, fast, and unbelievably delicious recipe with you for weeks and am practically jumping out of my chair typing this because you’ll finally be able to try it! This plant-powered gluten-free noodle recipe is total comfort food while still being wonderfully nourishing and easy enough for the busiest of weeknights. It’s a no-fuss way to satisfy your takeout cravings while still doing something wonderful for your body. This recipe is a healthy twist on classic takeout stir fry noodles. Most restaurants typically make their stir fry dishes with egg noodles and loads of oil. This dish, however, uses buckwheat noodles which are gluten-free and have an awesome nutty flavor along with just a small amount of delicious sesame oil. 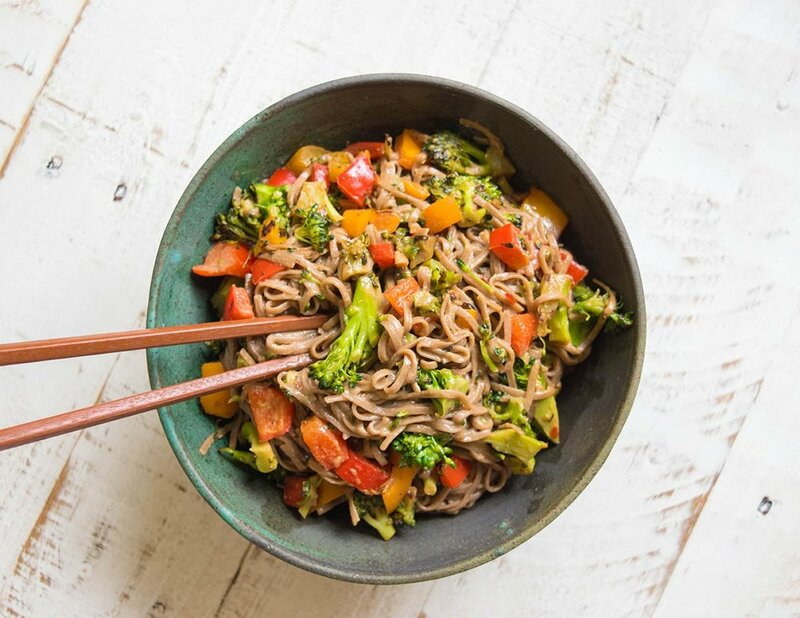 The noodles are mixed with all sorts of super fantastic foods like ginger, garlic, broccoli, and bell pepper, and are seasoned with a peanut butter and tahini-based sauce. YUM! I’d be embarrassed by how much I’ve eaten this dish over the past month if it wasn’t so absolutely spectacular. Try it and I guarantee you’ll fall in love! If you’re looking for other effortless and nourishing weeknight noodle dishes, try my 5-Minute Cashew Kale Pesto Pasta, my 10-Ingredient Healthy Pad Thai, and my 10-Minute Chickpea Bolognese Pasta! Start by cooking your buckwheat noodles according to package instructions. They do tend to hydrate a bit faster than your typical pasta noodles, so keep an eye on them as you don’t want them to get too clumpy. Drain and rinse the noodles while they’re still slightly al-dente and set aside. For the veggies, simply start by heating 2 tablespoons of sesame oil in a medium-sized pan over medium heat for about 1 minute before adding the chopped garlic and ginger. Heat for an additional 1-2 minutes to release some of the aromas, then add the chopped broccoli and red bell peppers. If you’re feeling adventurous and looking for some extra veggie goodness in your noodles, try chopping up and adding the broccoli stalk in addition to the florets. Heat the mixture over medium for about 2-4 minutes, stirring often, while you prep the sauce. To make the sauce, simply add the ingredients from tamari to chili flakes together in a small bowl and whisk together to combine. Once you’ve done this, you’re ready to put it all together! Simply add the buckwheat noodles and sauce to your veggie pan and gently fold the veggies and sauce into the noodles to combine. Top with sesame seeds for some extra crunch and serve it on up! These noodles are equally delicious hot and cold and keep well for about 5 days in an airtight container in the fridge.